Great Summer Recipes for Dad and a Party Crowd! There are some days when the only thing that will satisfy is a big juicy burger. As we diving head-first into BBQ season, you have probably devoured your fair share already. While the classics never go out of style, it’s always fun to put new twists on old favorites. As you gear-up for Summer festivities, you’ll definitely want to add my Meatball Sliders to your menu. 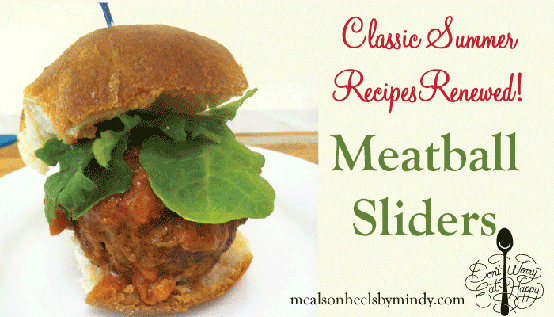 But don’t wait too long, because year-round, these irresistible sliders remain crowd favorites. If you’re grilling up steak, fish and poultry, I like to forgo calorie-laden barbecue sauces and opt for flavor-packed homemade rubs. Lifestyle tip: Make extra and package it in a simple mason jar for a terrific BBQ host gift. While it may be hard to say no to those super creamy sidekicks–potato and macaroni salad– it’s easy to whip up healthier versions that don’t require copious amounts of mayo. One no-fail option is my Peruvian Potatoes with Feta recipe. I promise–losing those unwanted calories means that succulent beef burger will be more satisfying than ever! Puree sauce in processor until almost smooth. Return to same skillet. Add meatballs. Cover with lid slightly ajar and simmer until meatballs are cooked through, stirring occasionally, about 30 minutes longer. DO AHEAD: Can be made 1 day ahead. Cover; chill. Place Arugula leaves on bottom of each roll, if desired. Top each with 1 meatball. Drizzle meatballs with some sauce and sprinkle with remaining two tablespoons parsley and two tablespoons cheese. Cover with tops of rolls.